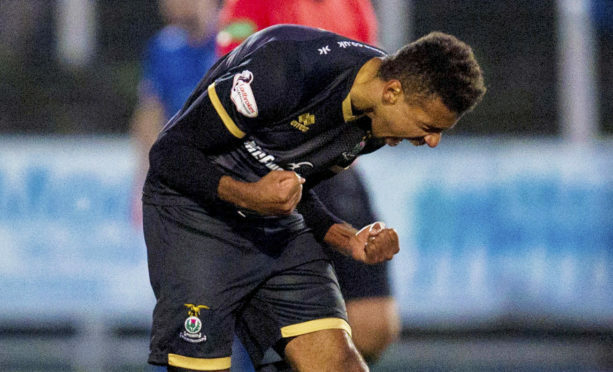 Caley Thistle forward Nathan Austin reckons Edinburgh City’s players will be eager to put themselves in the shop window when they host Inverness in the Scottish Cup tomorrow. Edinburgh are top of League 2 having won 10 of their 12 matches so far, with James McDonaugh’s side aiming to conquer Championship opposition for the second time in just over a week following last weekend’s penalty shoot-out victory over Alloa Athletic in the IRN-BRU Cup quarter-finals. Hertfordshire-born Austin began his career with part-time East Fife, where he came up against Rangers during the Ibrox club’s season in League 1 in 2013-14. Austin reckons Caley Jags must be wary of a City side determined to prove themselves against a higher calibre of opposition, and he said: “I experienced it at East Fife. “When you’re at a lesser club like Edinburgh City – no offence at all to them – when you play a team from a higher league you want to show what you can do. “Hopefully that can be the stepping stone to get a new club. I played against a few big teams while at East Fife and I think that maybe helped me get a move in the end. “When you’re at clubs like that, that’s what you’re aiming to do. “I wouldn’t say there is fear of an upset, but we’re a little bit anxious to get going. Maybe the pitch isn’t going to be as good as usual, but it’s a game of football. “They beat Arbroath in the IRN-BRU Cup, so we know they’re capable of an upset. “They are flying high in their league, so we can’t take it for granted. I don’t think it is going to be as straightforward as some people think, with us going down and winning by three or four. Inverness will break from their 25-match unbeaten league run when they make the trip to Ainslie Park, however Austin is relishing the prospect of a cup run, with the 24-year-old adding: “I think a lot of the boys are excited. Scottish Cup days are always good and there is history here with Inverness winning it. “When this club did win the Scottish Cup, they were a top side in the Premiership. That’s not where we are at the moment.